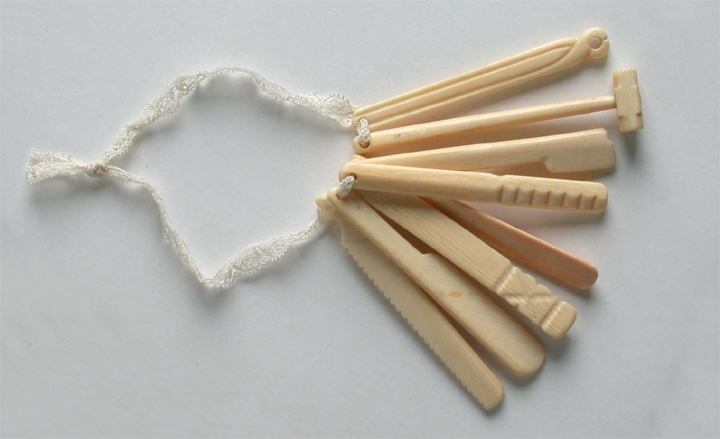 Teething pegs like the ones shown here were popular in the late Victorian and Edwardian eras before plastics became a suitable material. They were used to soothe and amuse a baby who was suffering from sore gums as its teeth came through. There are eight ivory pegs attached to a lace ribbon. The ribbon kept the pegs together. It was tied to the baby’s clothes, so it kept the pegs close to the child. Each peg is slightly different. One is shaped like a saw, with a serrated edge. The baby could investigate its emerging teeth by running the saw over its gums. One is shaped like a hammer - the baby would enjoy sucking this. A third peg is indented on either side with different carved marks and a fourth is shaped like a cricket bat, wider at one end than at the other. The fourth and fifth pegs are carved into different shapes, one with lines running up to a tiny hole, and the other a triangular shape with criss-cross carving at one end. These were interesting pegs for the baby to explore with its fingers, helping it discover different shapes and texture. The two remaining pegs are shaped like toothbrushes, with a slightly sharp end to massage tender gums and to be bitten on by brand new teeth.